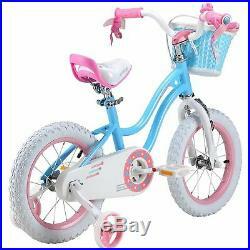 ROYAL BABY STAR KIDS PRINCESS CHILDREN CHILD GIRLS BIKES IN SIZE 12. 12 sizes steel spoke'd wheels with U BABY extra strong pneumatic tyres. Chromoly steel Frame with Unicrown Front Fork. Front basket, handle bar ribbons. Adjustable handlebar height, adjustable seat height. Front calliper brake and rear band brake, enclosed Chainguard. Heavy duty removable adjustable stabilisers. 12 suitable for ages 2.5 - 4.5 year. The item "ROYAL BABY STAR KIDS PRINCESS CHILDREN CHILD GIRLS BIKES IN SIZE 12" is in sale since Saturday, January 19, 2019. This item is in the category "Sporting Goods\Cycling\Bikes". The seller is "florencemiller-ltd" and is located in London. This item can be shipped to United Kingdom.